A strong core is much more than those show off six-pack muscles. You’ve got to train the front, back and sides, and you’ve got to go deep, hitting the support muscles that reside a fewer layers beneath the surface. 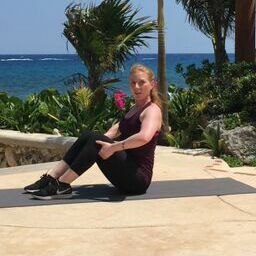 AcaciaTV trainer Liz LeFrois shows you how to take your core workouts 3D with these four exercises that work your middle from every angle and direction. Try 1-3 sets of 8-15 reps each. Do this routine 3-5 times per week for a flatter, stronger more versatile core in no time. [A] Sit up tall on the floor with your knees bent, feet flat on the floor. Lightly grasp underneath your thighs. [B] Scoop your belly in by pulling your ab muscles into your spine and rounding your back. You’ll lower a few inches towards the floor and create some tension on your arms. [C] Hold for a moment then straighten back up to the start, sitting up even taller by engaging all your core muscles. [A] Lie on your back placing your hands underneath the small of your back, palms down, for support. Li ft your head up to look at your navel and pull your ab muscles in toward your spin. Lift both legs a few inches off the floor. [B] Slowly flutter kick your straight legs a few inches up and down until you complete the set. [A] Lie face down with your legs out straight and arms at your sides. Pull your ab muscles into your spine for sup port. [B] Lift your head, shoulders and chest as high off the floor as you can without feeling strain in your lower back. Hold a moment and lower to the start. [C] Once you complete the set sit your heels back onto your buttocks in a child’s pose to counterbalance the work. Liz’s workouts are coming soon to the AcaciaTV site. In the meantime, start your 10 day free trial for access to over 100 hours of fitness content you can stream anytime, anywhere from any device. Check out this bonus core move!